By combining a microfluidic system into a direct laser writing (DLW) 3D printer, a team of German scientists printed microstructures consisting of several materials. The achievements of 3D micro and nanoprinters are well established, from 3D printed microfluidic systems to 3D printed movable microstructures. But as outlined by the German researchers, the addition of a few off-the-shelf components can unlock the true potential of (certain models of) direct laser writing 3D printers. The team was led by Frederik Mayer at the Institute of Nanotechnology (INT) in the Karlsruhe Institute of Technology (KIT). 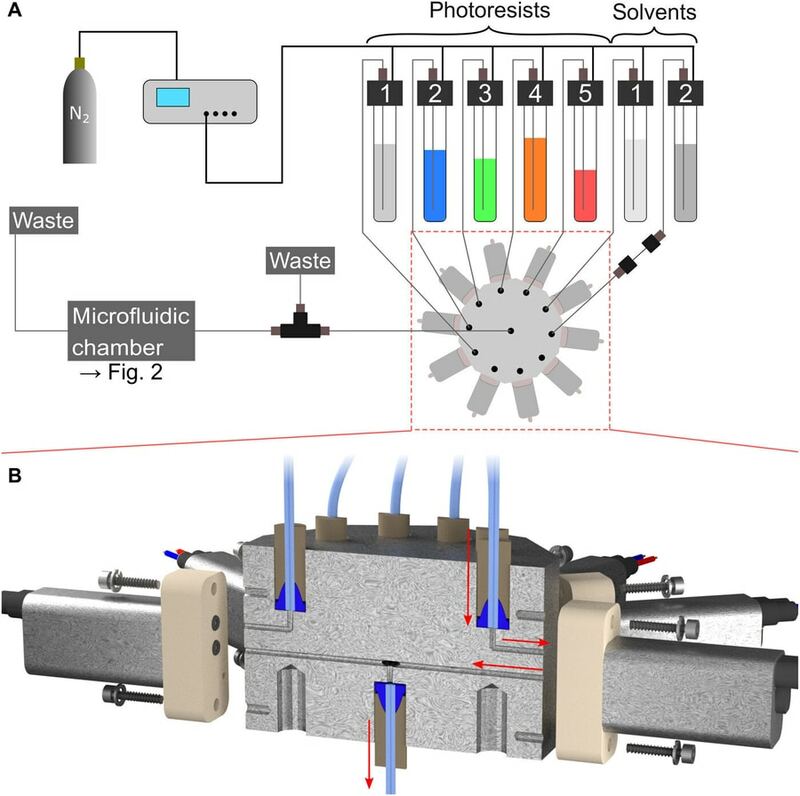 They modeled their microfluidic system around a Nanoscribe Photonic Professional GT DLW 3D printer using commercially-available microfluidic components such as connectors, flow switches, valves, flow controllers, and switch flow matrices. A star-shaped selector controls which fluid is injected into the build area. The build height of the DLW is only 100 microns due to limits on optical focusing, so only a minuscule amount of fluid is injected into the build area to be selectively cured by the laser. 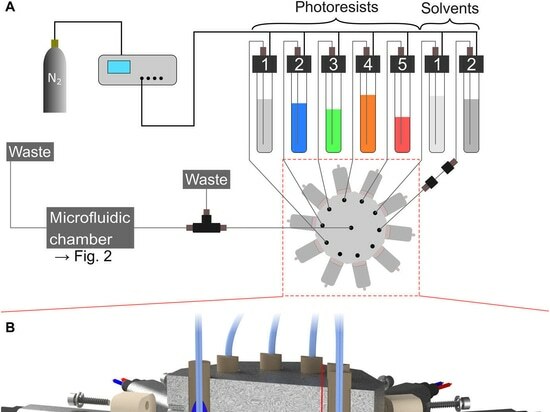 Another fluid material can then be selected and injected for curing, and their prototype microfluidic selector can handle up to seven different materials.To demonstrate its capabilities, the team 3D printed a deterministic microstructured 3D fluorescent security feature based on multiple emission colors. To fabricate the barely-visible structure, they used “seven different liquids within the microfluidic system: a nonfluorescent photoresist for the structure’s backbone, four photoresists containing fluorescent semiconductor quantum dots and organic dyes with different emission colors, and two developers (mr-Dev 600 and acetone).” The developers are solvents used to rinse away the other materials when changing between them. The result is a five-layered object with a complex grid of different fluorescent markers selectively positioned throughout the layers. The entire object is a mere 112 microns across and only 54 microns tall, so arranging seven different materials into a precise three-dimensional array in an object that small is no small feat. The structure is so tiny, in fact, that all of the fluids experience Laminar flow (a non-turbulent state of flow that occurs when all of the molecules are traveling in a parallel direction) when injected through the microfluidic system. With 26 × 26 × 5 possible marker positions in the x, y, and z directions, the security feature can store 7.8 kbit of information. It’s just as likely that a company like Nanoscribe will release a new DLW model that incorporates the microfluidic system, or at least an upgrade that standardizes the process. 3D nanoprinting is advancing at a rapid pace; by using conductive and tunable metamaterials in such a system, 3D printed nanobots will be a real possibility.